The best 10s chain that shimano ever made! There's no other chain than this one, just hit the "buy now" and be happy. Always used Sram for the ease of Powerlink but tried Ultegra for something different and is just as good. DuraAce chain does not seem to be available so I use this chain on all better 10 speed set-ups. Good shifting (if installed in the right direction), long life. May be a bit noisy at first with some gears, but quiets down with use. Excellent chain for all-round performance and value. I upgraded from a lower-level Shimano chain, not sure exactly which one, but this Ultegra version seems to shift slightly better. It might be just perceived smoothness, but regardless it definitely seems better than before. Exactly what you would expect from high quality chain. Pretty quiet, last long. Not much more to say about it, really. It does its job well. Really good quality chain, should last for miles. Shimano chains are always super smooth, quiet and great quality. As always chain performs exactly as expected, at a great price. Great chain, never use anything else. Great service from Merlin as always. Great product, I would not put anything less on my bike. With the Ultegra cassette and derailleurs I have problem free shifting. Great lightweight chain, have used shimano products for years and know they are reliable and long lasting, and can take a lot of bad weather, dirt and grime and still work without any loss of traction. Replacement for an identical chain - worth the cash to replace regularly. My favourite 10 speed chain. I usually get around 4000 km out of each chain. Keep it clean and well lubed. I'm using this on my 1x10 mountain bike and it's shifting as well as any other Shimano chain I've used (XTR and XT). I have used these chains for many years and find them to work well. I ride hard at a low cadence so am very hard on chains. These typically last me about 2,000 miles so are about the best value dollar per mile. Very durable quite chain. GREAT improvement to my drivetrain! Shifts very well! Does the job and shifts nicely (comes with one pin) - make sure you put on the right way as it is directional. Typical robust Shimano product, have been using this model chain for tens of thousands of kilometres and never had a failure. Merlin had the cheapest price at the time of purchasing of all the major online retailers and the free delivery to Australia meant I paid around half of what it would cost to buy locally from a store. Must buy product for sets to the shimano 105. I am using tiagra set but pedaling and shifting performance was changed dramatically. It bends and flexes incredibly nice and doesn't make any problems. A light chain that shifts well. Great chain, runs very quietly! Smooth as butter. Excellent chain and value. Only a chain but you won't get far without a reliable one! I have always found the upper range of Shimano chains 100% reliable and with care, very long lasting. I appreciate the design of this chain - it's specifically engineered for incredibly smooth shifting and light weight. Fantastic value from Merlin. Great chain quick, smooth gear change, why spend more on Dura Ace? Looks resistant to corrosion and overall better quality than the 105 chain. When paired to the Ultegra cassette seems a bit smooother. Cannot speak about durability yet. A smooth, well engineered chain. I am now on my fourth Ultegra chain and cassette combination and they have performed flawlessly. There is no real difference to dura ace other than the weight saving for me so save your cash !! One massive difference I have found is that I replaced the Jagwire cabling on my bike with the Shimano PTFE kit and WOW ! It's transformed my Ultegra set up. The shifting is ultra smooth. When changing up or down it's a slight push to the click and it's changed. No more push and hold or push and push a touch more then oops it's a double click like with the Jagwire cabling. I never realised how good Ultegra really is until I switched to PTFE. Oh and thanks Merlin for your as usual excellent prices and delivery times !! Excellent product, long life, good performance..
Great value chain from a trusted brand that lasts for ages with an occasional clean and lube. Smooth running and quiet, as to be expected from Shimano. Fitted this to my Sram Red group set, replacing a Sram Force chain which was not worn just very noisy. It sounds much quieter now. I do find Shimano chains to be the smoothest and quietest. Plus at Merlin's price it is a real bargin. Very easy to install as shimano supply a special pin which you can slot in place with your fingers and away you go. I only wish they would include a powerlink like some other brands so that you don't have to use a chain extractor tool to remove the chain. A minor niggle as it's not something you would need to do very often. In terms of longevity or performance only time will tell. This chain was simple too fit and comes with one chain pin. Fits nicely and runs very smooth. Tested this out on a 75 mile ride and a 50 mile ride so far and it certainly glides nicely. Running this chain on a sram force crankset and ultegra fd, rd and cassette. Great price at present on Merlin and well worth a go. Not much price difference between 105 chain and this one however weight saving and performance i believe are noticeable. Excellent well made and reliable chain, Quiet and smooth shifts, I always use the KMC quick link as the Shimano pin is a Faff and it makes taking the chain off much easier. Make sure that you put this chain on the right way as its directional. As always top service from Merlin, great price and rapid delivery. I've got through loads of these and keep coming back for more. It does what it's supposed to and I've not had one snap on me for well over ten years. I've also ridden them with three joining pins, due to a number of frame swaps, with no problems. I'm very happy with this product. A high-quality chain at a fair price, with Merlin's usual rapid service. Quality shimano chain, not Dura Ace but whos checking? Brilliant chain - runs as smooth as silk even on a 2006 version of the Ultegra groupset. Great price too. Great shifting chain and pretty light. Wouldn't use any other with my Ultegra groupset. Just remember it's directional and has to be put on the right way around! Great chain. Essential for your bike maintenance. Great price and ultra swift service. 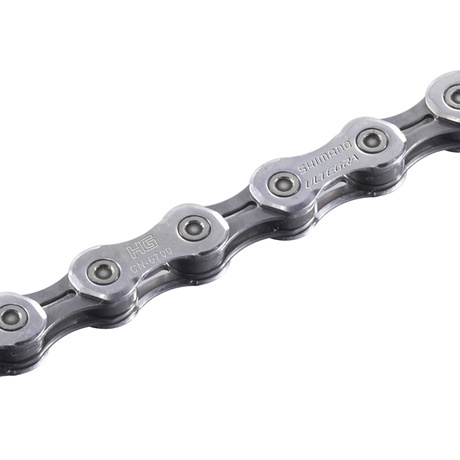 Good quality chain - always use Ultegra chains and never had any bother. Last one saw me through all the filth and grime of the 2012 english summer and still cleaned up well after each ride. I generally change them after about 1500 miles, by which point my chain checker is starting to indicate enough wear to warrant the change. With Merlin's discounted price, it's a lot more affordable to change them! Great chain at a reasonable price. Works especially well with Shimano drive train. Ultegra is a solid option at the price point. This does the job and has never failed on me in five years. Excellent piece of kit at an excellent price. Quality Shimano product at a very very good price. Will be ordering more soon!! Shimano Ultegra first class components will purchase every time, 5 star. Shifts well, light, no problems so far. Can't fault the chain. Merlin's service was, as usual, incredibly fast. Overall, very happy! No packaging other than plastic wrap, which honestly doesn't matter, but a great deal on the chain! Bought this chain to use with a new Ultegra cassette. My original chain and cassette were Shimano 105 5700. To be honest I don't notice any different in shifting performance. Shimano gear shifts are very good across the range of groups anyway. Very solid and silent chain, very pleased with it.